BioShock is an epic story with an atmosphere unrivalled by any game currently available on any platform. In looking for a game to play, I saw trailers for Bioshock. To be honest, it wasn't a game I thought much of. I moved on and played numerous other games. Some time passed and a friend of mine mentioned the game to me and insisted that I try it. He let me borrow his and it took me a very long time to return it. After playing it 4 times all the way through, he convinced me to return his game and buy my own! BioShock is an amazing game! It has a well put together storyline, astounding graphics, gripping sound, and extraordinary gameplay. It's a first-person shooter game, but it combines the basic features of a first-person shooter with an amazing and addictive story similar to a role-playing game. 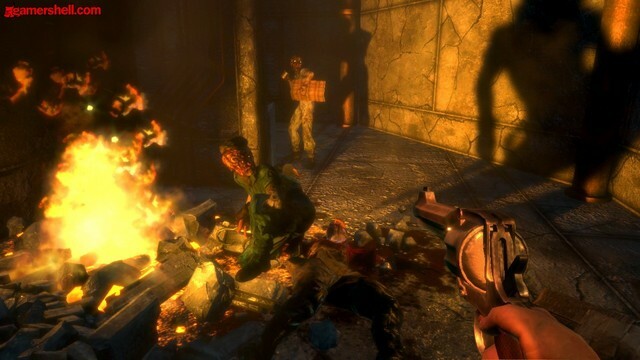 It is neatly combined with the horror genre adding a great deal of suspense into the game. 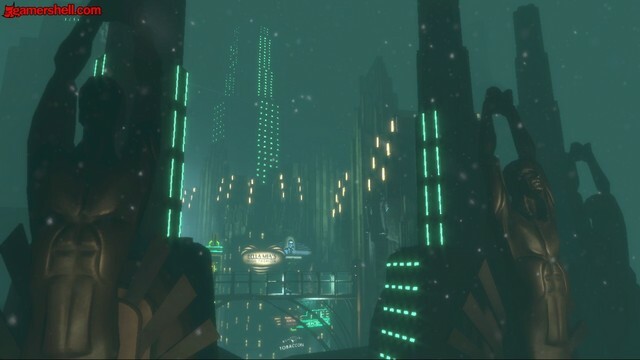 Your adventure takes place in an underwater city known as Rapture, built by the insane man known as Ryan. When you first come into the city, everything is in shambles. All the residents have become senseless killing machines all because of ADAM. ADAM is generated by a deep sea parasite, when it attaches to a host; the parasite produces new stem cells healing the host. With ADAM you can get what is known as plasmids, or powers. Some of these powers include things like electricity, fire, shooting bees out of your hand (and the list goes on). The key to a successful FPS are the weapons. Bioshock does not disappoint in this area! The vast array of weapons leaves the player with the question, "In which fashion should I dispatch this enemy?" From plasmids to shotguns, wrenches & rocket launchers. Soon you realize that even combinations of weapons can be visually entertaining. Plus, the ability to improve these weapons by upgrading them compels you to see what they can do at their next level. As fun as the weapons are, the true value of this game is the world of Rapture. This incredibly horrifying world had me hooked from the second the Bathysphere (the undersea equivalent of a subway) descended and I saw all those neon lights. That's when it hit me that this isn't just a game, but a new reality, with a story waiting to unfold. The graphics are incredible, to say the least. They aren't there just to look good, but to draw you in, immerse you, and make you want to explore this amazing place. From the neon lighting to the black and white checkered floors, it mixes a 50's style with a sci-fi twist. You soon come to realize that this isn't just a game. It's a work of art! Full immersion into the world of Rapture requires a sound design that must match the quality of the graphics. The designers met this requirement magnificently! The ambient sounds of an underwater city are complimented beautifully with the constant drips from the sea pressing in on the other side of long glass hallways. The constant drum of machinery buzzing in the background reminds you that this place is not alive, but manufactured, cold and empty. And the conversations that you can occasionally overhear prior to a conflict can be quite entertaining. All of these factors play a large roll in adding suspense to an already extraordinary game. 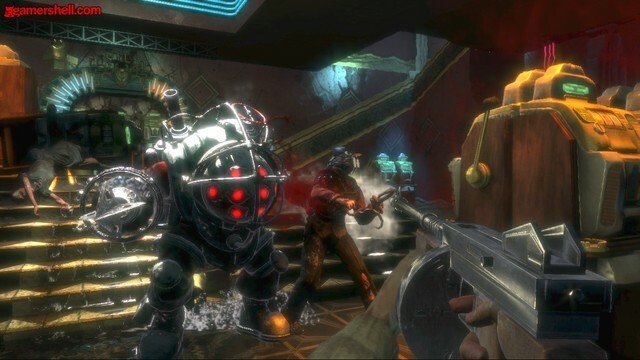 Bioshock's gameplay is very intuitive and easy to pick up for beginners. The controls are laid out in such a way that they never feel like they interfere with the immersion factor in this game. The only gray area someone could run into while beginning this game is the understanding of what roll plasmids, EVE & ADAM play. But it takes very little time to comprehend these concepts and continue on in your adventures. In the end, it's the combination of a highly memorable story, fantastic gameplay and constantly suspenseful thrills that make this game one of the best video games ever made. Pure perfection!